“This is what makes superheroes fly” said the middle schooler as he presented his emptied bowl for a refill. I took it as a high compliment! This soup is exquisitely good – liquid comfort and a reasonable number of calories and carbs, too! 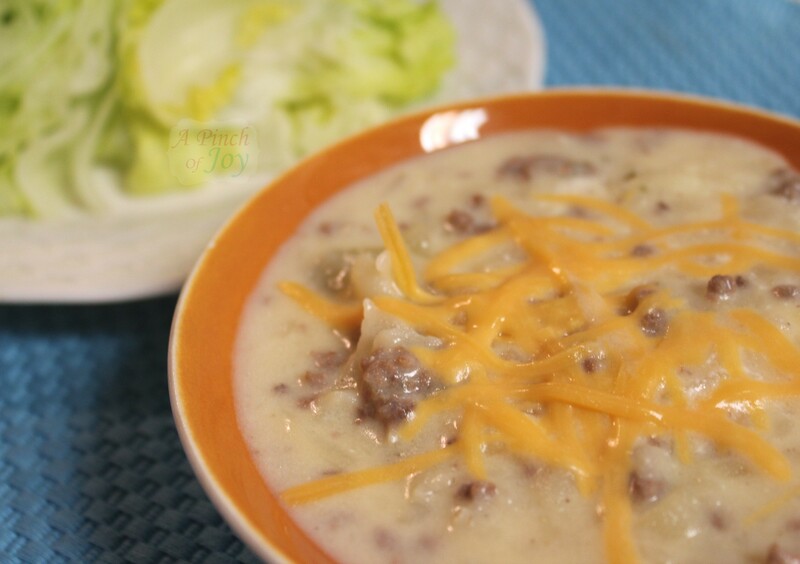 Serve it on a rainy or cold winter evening with a lettuce wedge and it is just like cheeseburgers — only waaaaay better. Make this at least once with fresh potatoes shredded by hand or in the food processor and with fresh shredded cheddar and fresh parsley in the quantities given. That was the way I learned to make it and It. Is. Superb. You may decide that you will find the time to do it this way every time. But your family may be like mine with all kinds of schedules and limited time for food preparation – although we always find time to sit down and eat together. If so, you need the quick and easy version that you can make and have on the table in half an hour or less. The biggest timesaver – and healthiest pre preparation – is to always have browned lean ground beef on hand for any recipe that needs it. I buy 10 to 15 pounds of ground beef at a time when it goes on sale. I buy the leanest grind I can find, preferably at least 85% lean, but 93% when I find it. This percentage means that there is 15% (or 7%) of animal fat in the meat. If you are grilling hamburgers, you will want the 15% fat so you end up with moist burgers. Otherwise the fat just goes to line your arteries or create middle pudge and who needs that? Every package of ground beef sold has to have that information on it, so take a few seconds and look to see what you are buying. Simple change – big difference. Once you get the meat home, brown it and package it to suit your use. An efficient way to do this is to put your two largest skillets on the stove, a large colander in a 9×13 baking pan in the sink and a box of gallon sized ziplock or vacuum seal bags on the counter. Sprinkle salt on the bottom of the skillets to keep the first batch of meat from sticking – it will not be enough to flavor the food. Break the packages of meat in pieces as you put them into the heating skillets. I can do about a pound and a half in each of my skillets. Move the meat in the skillet as it browns. When no pink shows, pick up the skillet and pour its contents into the large colander. Let it drain and cool while you refill the skillet. You can pour from the colander into another container to let the browned meat cool further, but I put it directly in the bags after the meat stops draining and let the bags set, open, on the counter. Continue to brown and drain, until you have finished all the meat. When packages have cooled, seal, being sure to push out all air, flatten and stack in your freezer. Let the grease collected in the bottom of the baking pan cool and harden, then put in empty cans or bags and dispose of in the trash. Let’s not talk about why we do NOT put it down the garbage disposal — mkay? Trust me – don’t do it! A Dutch oven works well for this recipe. Saute’ onions and celery in 1 tablespoon of butter, until crunchy cooked. Add broth, meat, and potatoes and cook until potatoes are soft to a fork. Meanwhile make a roux with butter and flour, whisk in milk. Add to soup around half a cup at a time, stirring well and bring to boil again, for about 2 minutes until somewhat thickened. Reduce heat to low. Add cheese –shredded cheddar, diced Colby jack, American, any yellow cheese that suits your family. When cheese melts, remove from heat and stir in sour cream to add just that bit of deep note to the flavor. Brown ground beef, if you have not already done so. In Dutch oven or deep pan, saute' onion, celery and parsley flakes in 1 tablespoon of butter, until crispy tender, about 7 -10 minutes. Add broth, browned meat and potatoes to the Dutch oven. Bring to boil. Cover and simmer until potatoes are tender, about 10 minutes. Meanwhile in small skillet, melt 3 tablespoons of butter and add ¼ cup of flour until a thick paste forms. Whisk in milk about half a cup at a time and cook until thickened over medium heat, stirring frequently. Add milk and flour mixture to soup, again about half a cup at a time, mixing in well. Bring to boil and let boil about 2 minutes. Reduce heat to low. Serve with a pinch of cheese on top. Makes 8 generous servings with approximately 300 calories and 23 grams of carbohydrates. I’m so glad you stopped by today! Be sure to follow A Pinch of Joy so you don’t miss a thing! If you found this helpful or inspiring please share below! I’d love to have you along on this journey! This was so very good!! There is a new potato soup in town, mine will be on the back burner now, I am sure. Kids were thrilled on this cold snowy day to have hot, yummy soup to come in to after their sno-ventures! 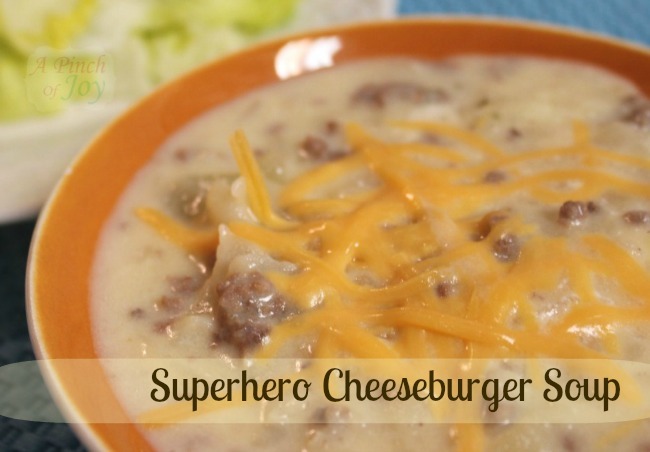 I can sure see why its called Superhero Cheeseburger Soup. 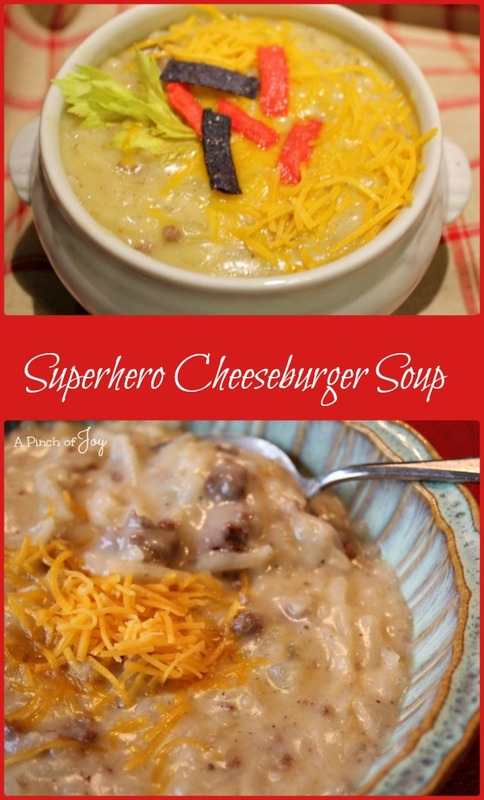 This is an awesome recipe, that we would just love. Hope you are having a great week end and thank you so much for sharing with Full Plate Thursday. thanks for stopping by — see you at the party! thanks for coming by — nice to be appreciated! Oh my goodness! This sounds divine on such a day like today- cold and rainy! Please make some for me and drop it off at your convenience! hee hee. PS Will you show this off at my place on Wednesday? You could win a $5 Starbucks card! This looks terrific. Can’t wait to try it. thanks, Renee! I like the idea of the roaster — and the hot water rinse! That’s a great idea!